One of the strangest riots in Boston history occurred on the morning of January 6, 1975. Led Zeppelin was scheduled to perform a rock concert at Boston Garden on February 4, and the tickets were to go on sale on January 6 at 10:00 am. 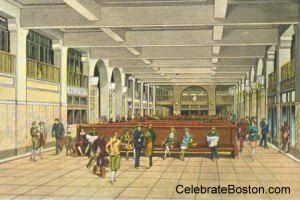 Because a huge crowd had gathered the night before to buy tickets, Boston Garden opened its doors at 11:00 pm on January 5 as a courtesy to let ticket buyers stay out of the cold. Tickets went on sale at 2:30 in the morning and sold out at 6:00 am (about 9,000 tickets). Over 2,000 young people jammed the hallways of the Garden waiting to buy tickets. For no apparent reason, the crowd went wild and decided to break into concession stands, the arena, and the Bruins and Celtics locker rooms. They stole products and vandalized the building. Eleven concession stands and two souvenir kiosks were broken into. 300 cases of beer were stolen and consumed on the spot. A drunk and rowdy crowd swarmed different parts of the Garden, and mayhem ensued. The drunken mob turned fire hoses on each other and had water fights, which they later fired at police. Fire extinguisher fights also occurred, leaving a chemical residue in Garden hallways and concession stands. A piano was dragged out onto the ice in the arena and was severely damaged. Boston Police Tactical Division officers dispersed the crowd and confiscated several knives. It is amazing that no one was seriously injured during this drunken, bottle-throwing riot by a crowd of significant in size. People could have been asphyxiated to death by being crushed against fences or doors. The damage to Boston Garden was initially estimated at $75,000, but the true cost was somewhere between $10,000 and $20,000. No arrests were reported which is strange. The generosity of Garden management to shelter ticket buyers from the cold was probably extended a second time by not prosecuting the major players of the riot. On January 14, 1975, Mayor Kevin White refused to issue a license to the band due to the riot, and the performance never took place. Canceling the concert temporarily created the headline "Led Zeppelin, Banned in Boston." On February 4, the band played at Nassau Coliseum in New York instead. Somewhat related, on December 3, 1979, 11 rock fans were crushed to death at a Who concert in Ohio due to an open seating arrangement and rush by a large crowd.